Environmentalists have held protests around the world demanding stepped up measures against climate change, ahead of a summit in California next week. Politicians, business leaders and celebrities will attend the Global Climate Action Summit, whose sponsors include the UN, Facebook and Google. Thousands protested in Paris, days after France's environment minister quit over perceived policy failures. The demonstrations have been organised by the group 350.org. In all, more than 900 protests were held in 95 countries, the group said. On Friday, Pacific island nations declared climate change to be the "single biggest threat" they face. The protests began on Saturday with tall ships sailing into Sydney Harbour in Australia. Australia remains heavily reliant on coal to generate electricity, but activists say the country must join an international push towards renewable energy. In Bangkok, the capital of Thailand, environmentalists demonstrated outside a building where climate experts were discussing the 2015 Paris accord. The agreement commits nearly 200 countries to keeping rising global temperatures "well below" 2C above pre-industrial levels. Last year President Donald Trump announced the US would pull out of the deal, but this will not become effective until 2020 at the earliest. Environmental groups accuse the US of using UN talks to reduce the contributions of developed countries to the Green Climate Fund, which was set up to help countries deal with the effects of global warming. In Manila in the Philippines, demonstrators demanded an end to the funding of fossil fuel companies and more investment in renewable energies. German environmentalists protested outside the open-pit Tagebau Hambach coal mine in the west of the country. 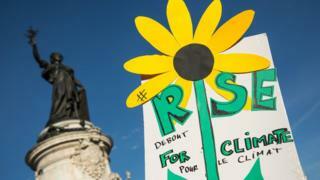 In France, where popular Environment Minister Nicolas Hulot quit in frustration last week, rallies were held in several cities, including Paris, Strasbourg and Marseille. Official estimates said 18,000 marched in Paris, but the demonstrations organisers said 50,000 attended. "Citizens gathering around the world have the power to drive change for our children's future," the former minister said (in French) on his Twitter account. At a protest in downtown San Francisco in the US, signs made to look like solar panels were placed on pavements near the protest. Signs were emblazoned with slogans popular with Mr Trump's Democratic opponents, focusing on immigration and social justice.